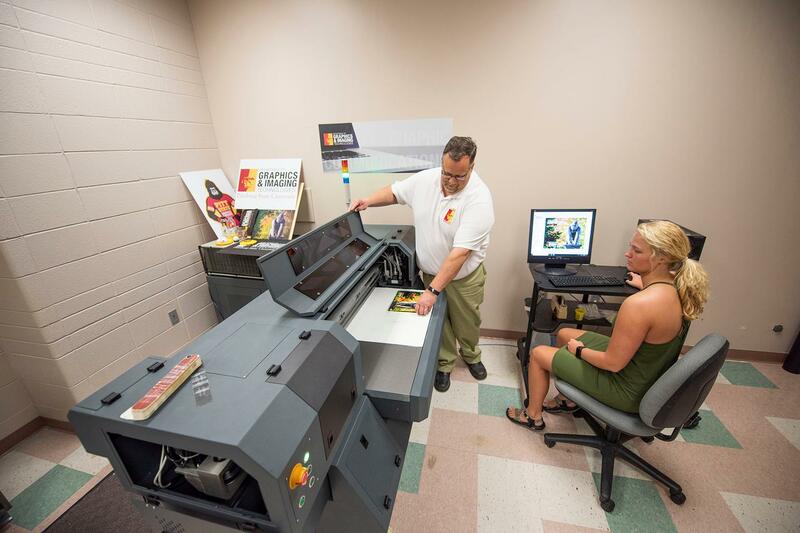 Pittsburg State University’s Graphics & Imaging Technologies program has received accreditation as one of the 12 top programs in the country, making it official what students like Blake Broaddus already knew. "For the GIT program to be regarded as one of the top programs in the country is not only a phenomenal honor but also a well-deserved one,” said Broaddus, a 2013 graduate from Diamond, Missouri, who is now a video production manager for J.B. Hunt Transport. After the completion of an extensive study and site visit by a team of industry and education experts, the Accrediting Council for Collegiate Graphic Communications, Inc., made a formal presentation of the accreditation to Interim Department Chair Doug Younger in Chicago. Among the highlights of the accreditation report: PSU graduates go on to successful careers, and high marks for faculty. Broaddus said he regards the accreditation as a great accomplishment not just for current students, but future ones, as well. “This puts them in the premier job pool within our respected industries," he said. PSU’s GIT program offers a bachelor’s degree with a major in Graphic Communications. Students declare an area of emphasis in Digital Media, Graphic Design, Graphics Management, Print Media, Packaging Graphics, or Web/Interactive Media based upon their area of interest in the graphics industry. All six areas of emphasis within the Graphic Communications degree share a core curriculum. In addition to these classes, each of the six distinct areas have specific emphasis and support courses, to round out the major, as well as elective graphics classes, allowing students to customize their degree. “This is a great honor for the department as we are only the 12th program in the U.S. to receive this accreditation and the only one in the Central U.S.,” said Younger.